Want to see Convurt in action? This post was created using Convurt, listen to the audio below. Whether you’ve just launched your new website or you’re trying to gain more traction with your current site, there is no denying the power a blog can have on your digital exposure. Blogging helps your site drive traffic, establishes you as a leader in your industry, and can convert visitors into leads if you keep it consistently updated. When companies blog, they open the floodgates to more online sharing via social media, engines can crawl your site for key words and phrases, and it grants the opportunity for other companies to link back to your site. 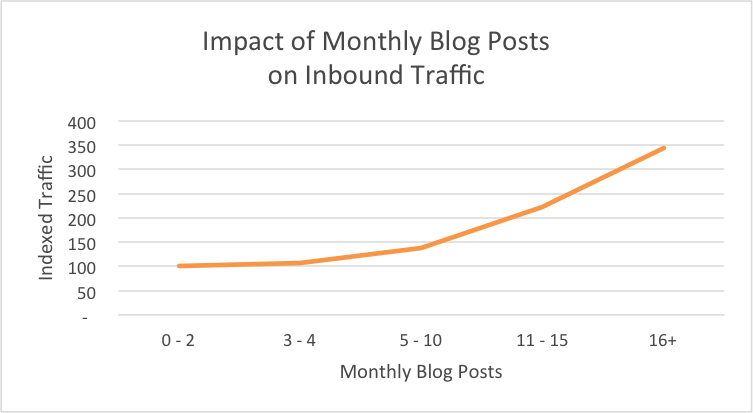 Hubspot reports that companies that publish 16 or more blog posts every month see a 3.5x higher increase of traffic to their site over companies who only post 1 to 4 times a month. And while it may seem daunting to post so often, it’s important to consider the lead goals you’ve set for the month and if you’ll be able to reach them. Blogging can help get you there! But have no fear if 16 blogs a month seems astronomically unattainable! There’s good news and a number of strategies, or should we call them solutions? One of the first things to look at, or one of the easiest things to look at, is page count. It’s obvious that the more pages you have on your site, the more pages you can optimize around a specific search phrase. So, if you want to rank on Google for a new keyword you’ve just introduced, you’ll need to create a blog post around that keyword. Think of this as your master post. After you’ve created the in-depth blog of your choice, follow-up by writing related blogs that use that keyword. Interlink these similar blogs and even keep your master blog updated with your newly created links. This creates a web of important documents that search engines will use to rank you higher in search results. Kristin Lo, Marketing Director at new social media planning startup HeyOrca, agrees that “fresh new content helps search engines improve their understanding of the type of topics that your site is relevant to.” The more pages you have with your relevant keywords, the better you’ll rank. We know posting quality content frequently is the key to higher ranking. And again, it can seem time consuming to sit down and create new content consistently. But if you can manage to create one blog post a week, by the end of the year you’ll have 50+ blog posts! Similarly, if your main website is 10 or 15 pages, look at the difference between your website and your blog. 10 or 15 pages doesn’t give you a lot of keywords worth of optimization, whereas 50 blog posts around specific topics gives you ideal fine-tuned optimization for keywords. Plus, you can link back to your main website, allowing you to increase ranking on those pages as well. Of course, no matter how often you’re able to manage a consistent schedule, the rule still stands that quality always outweighs quantity. Kristen agrees that if you’re unable to post frequently you can still see results, they just need to hit the benchmarks of quality. “Creating in-depth posts less frequently can also carry plenty of weight with search engines. Particularly around less competitive keywords.” So, if you’re writing a blog about solar manufacturing technology for instance, as long as the post is in-depth, informative, keyword heavy, and long, it can still rank just as well as if you had posted twice a day. So now you just have to find the balance of what you can manage to do and occasionally you might have to enlist the help of others to reach your quota. It might take reminders and an organized place to keep your thoughts, but there are ways you can optimize your content creation strategy. There’s a brand new application just hitting the market designed specifically for content creators and copywriters. The app is called Convurt and allows content creators to store their ideas and brainstorms in one place. You can set reminders for yourself so that when your alert goes off you can pop right into the app and pick what you want to talk about from your brainstormed list and just start talking. The app works as a dictation platform which you can then send to a copywriter, which is a feature also hosted in-app. From there the copywriter works their magic and brings your thoughts together to create a finished product ready to be published! It’s so important to have a consistent content creation plan that you can stick to. With regular posting and effective linking, you can drive traffic to your website and inspire new leads. Of course, it takes a village to make strides forward. When you’re ready to take your business to the next level through blogging, try Convurt and see what our application and team of copywriters can do for you.